Uniquesec has AA credit-worthiness for good credit! 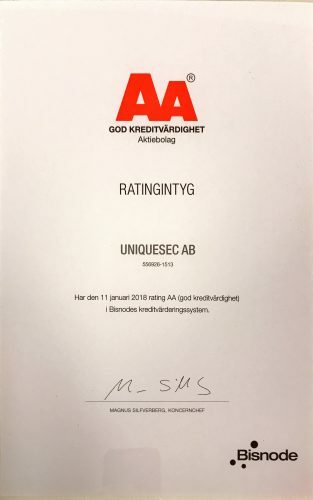 Uniquesec has a good credit with AA credit rating. Bisnode awarded Uniquesec the AA credit rating certificate. Uniquesec AB first patent application filed! Uniquesec AB received a 50k SEK grant for a patent in radar signal processing from Almi.